Suitable for any G324 petrol engines including cars, SUVs, RVs ATV etc.. Gauge with rubberized protector and dual color scale, tests up to 0-300 PSI and 0-20 kPa. 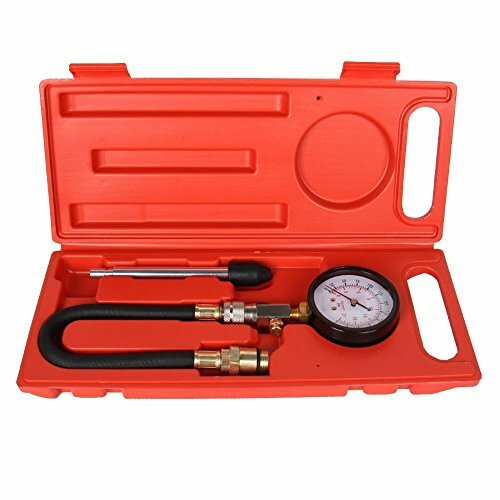 Air gauge with quick coupling & pressure release button. 10" durable rubber hose with M14*1.25 / M18*1.5 adapter. 6" heavy-duty stem with rubber cone cap fits different spark plug holes. Includes carrying case for easy transportation and storage. If you have any questions about this product by Jecr, contact us by completing and submitting the form below. If you are looking for a specif part number, please include it with your message.